Kicked off a public campus! Yesterday, dear readers, the team arrived on MTSU to find a campus ripe for the message: it seemed everywhere we looked people were totally depraved, backward and dark, while at the same time professing Christ. Terrible music was blasting in front of the Student Union building while girls sporting pink and black wedding dresses danced raunchily on the lawn... I overheard one man telling his friend how his rock band used to play worship music at their church but that it wasn't satisfying so they began writing songs and performing at the bars... one girl was acting like a cat, completely out of her right mind... just some of the bizarre sights we witnessed on this university. We set the banners up right in the midst of the chaos and began to preach. It wasn't long before a faculty administrator man arrived. He ordered us to leave the campus grounds unless we had a permit that required a 5-day process; a totally ridiculous and unacceptable obstacle for a university campus, which are traditionally open forums. It was a real shame, because a large crowd grew instantly, comprised of angry exposed 'Christians' and other curious onlookers. 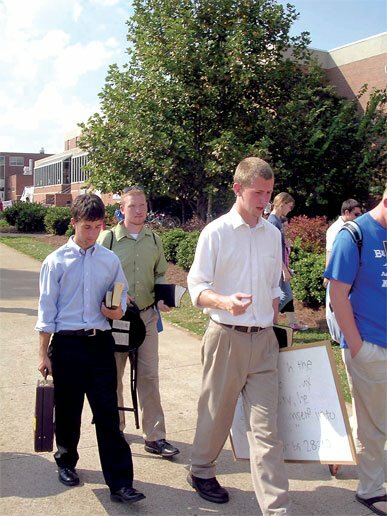 What bothers me the most, however, is that officials tolerate the kind of wickedness and loud music exhibited that afternoon on the knoll but not the preaching of the Gospel. After being asked to leave we delivered a short gospel message and packed up to go, but on our way off campus, the student journalists were running towards the scene and happened to meet us along the path out. They stopped us for a story on the incident and the next day it was on the front page of their school paper. You can read the article online here. Though we had to leave, all was not in vain, for the message got out clearly and we were also able to talk to a few students on our walk back to the van, as well as put a frontpage story in the widely read school newspaper. May the seed that went forth on this campus, though small in quantity, find good soil and produce a crop of lasting quality. Please pray for us that in the future we would have favor with university officials and that an this kind of thing would not be repeated.